In April ChildFund brought two stars of camogie to Africa to support our Dream Bike campaign for disadvantaged girls. RTE Nationwide cameras were on hand to capture some magical moments from the visit, which will be screened on Monday night. This Monday evening a special edition of RTE Nationwide will document a remarkable visit to Ethiopia by ChildFund ambassadors and camogie All-Stars, Aoife Murray and Mags D’Arcy earlier this year. Amongst many striking highlights from the visit, the programme will show what may well be the first ever game of camogie played on African soil! 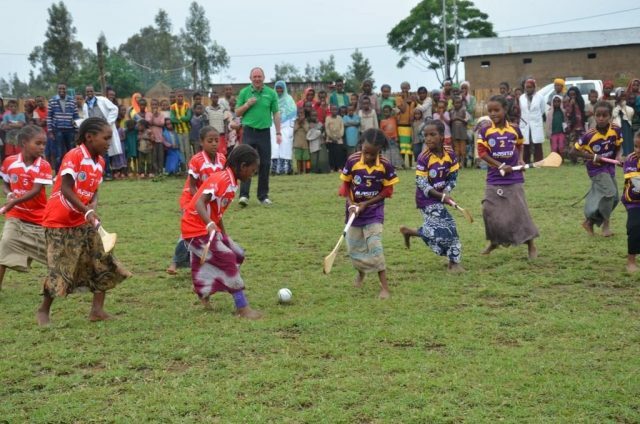 It’s was a hugely heart-warming and inspiring moment to see little girls from the Ethiopian municipality of Ropi kitted out in Irish County jerseys, wielding hurls and chasing a sliotar with great passion across the lush green grass and blood red soil of an African village. It’s hard to explain when you are present at a special moment…you can’t really explain it, you just sense it. Everybody there that day felt that same sense of witnessing something special, it was a unique cultural and sporting moment. That is why it is such a privilege to be able to share this with you this on Monday evening. In 2015 the Camogie Association selected ChildFund Ireland as its charity partner of choice, quickly followed by the launch of our Dream Bike campaign. The aim of this initiative is to provide bikes to vulnerable girls in developing countries who often have to undertake long, hazardous and exhausting journeys on foot just to attend school. Many girls are forced to drop out of school altogether but Dream Bike can help address that serious problem and ensure girls get the education they deserve. Aoife and Mags were present to witness the first batch of girls to receive bikes under the scheme. This truly joyous event, captured by the RTE Nationwide team, created enormous excitement, not just for the girls receiving the bikes but also their families and the local community who came out in force to join in and to celebrate with us. If you are a sports fan, if you are somebody of compassion who cares about the inequalities children have to endure, if you are someone who actively supports overseas development work, or someone who is thinking about it, or if you are simply interested in the world at large and celebrate other cultures…we hope you will tune in, watch the programme and be inspired to support us in doing what we do best – offering children a helping hand so they can achieve their dreams. The Nationwide Special will be televised on RTE 1 on Monday 5th September 2016 at 7pm. You Are Here: ChildFund Ireland > Newstitle_li=newsfeed1 > RTE Nationwide Special Captures the Moment Camogie Comes to Africa!